During the late 18th century, Jack Coppernose was out seeking his fortune in the beautiful Appalachian mountain range. However, while attending his distillery, Jack’s attention was drawn to the sound of voices on his property. Leaving to investigate the source of the sound, the equipment was now unattended. As it turned out, the voices were that of several representatives of the Law. Now Jack, being just a humble business owner, felt the good gentlemen wouldn’t understand his somewhat illegitimate vocation. Jack took one last pull on his rollup cheroot and flicked it into the copper. As his beloved distillery exploded into smithereens, Jack slipped past his unwanted guests unnoticed.Armed with just his senses and a pocketful of jerked beef, he fought his way through the moonshine smog and eventually found a clear view. In celebration of his deliverance, Jack grabbed a tender strip of beef jerky for a comfort chew, only to find it now had an added deeply intense smokey flavour to it. With great satisfaction, Appalachian Jack had finally realised his true vocation. Our aim is to bring the new standard of craft jerky to you, whilst enjoying the odd pint of craft beer along the way. 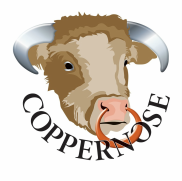 Established in the heart of the Cotswolds, CopperNose Ltd is the creation of two brothers, Liam and Daniel. Having grown up with American beef jerky, CopperNose was inspired to set a new standard in craft jerky. Using only 100% grass fed, ethically sourced British silverside beef, CopperNose is able to track and trace each order back to the farm. We pride ourselves on using the same principles the pioneers of the New World used, bringing you the next generation of craft jerky. The idea came during Liam’s final year at the Royal Agricultural University where he competed, placed runner-up in the UK Grand Idea Competition and was encourage to continue with the venture by the one and only Levi Roots, nicknaming Liam “The Jerky Man”. Daniel travelled the world in search of the best ingredients for CopperNose Craft Jerky. With the ever growing demand for CopperNose’s delicious handcrafted jerky, Daniel decided to come home and join Liam full-time. The company steadily grew with more and more joining the CopperNose Family as Liam and Daniel toured the country, bringing the UK the very best in craft jerky. CopperNose received the highest ratings from two of the biggest Jerky Guides in the USA. The Jerky Report, Brooklyn NY and Best Jerky, San Diego CA highly rated CopperNose Jerky and we received 5 STARS for our French Kiss – Garlic and Chilli craft beef jerky. CopperNose was awarded Virgin Startup Company status thanks to Mr. Entrepreneur himself, Sir Richard Branson and his team.